The ATI Supercharger Super Damper places the same powerful protection of the Super Damper inside the crankshaft blower pulley! Why bother with an additional blower pulley that bolts to your stock harmonic balancer? 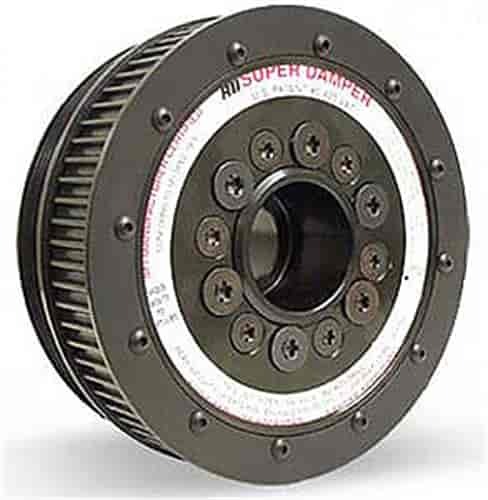 The ATI Supercharger Super Damper features external belt drives for virtually any type of blower belt, and eliminates the need for separate crank mounted blower pulleys. Crank hubs are available for all engines and are available with 25 tooth x 20mm 8mm HTD drive pulleys machined in the hub for dry sump or fuel pump drives between the damper / blower pulley and the engine. All hubs have dual keyways and are available in custom lengths for all cam belt drive set-ups from Jesel, Danny B, and Comp Cams. Numerous pulley offsets are available to keep the blower drive as close to the engine as possible to reduce the bending moment to the crankshaft nose. SFI-certified.